The MacIntosh Company has plans to open their seventh care community this winter in Canal Winchester, Ohio. 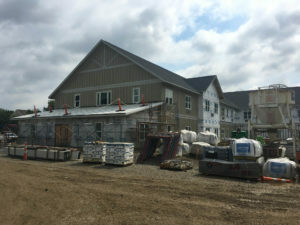 The 87,000 square foot facility includes 75 skilled nursing beds for both short-term rehabilitation and long-term care, as well as 35 assisted living apartments. Central to the design is the robust rehabilitation program, which features a prominent therapy space providing both physical and occupational therapy, and an attention to the unique needs of rehabilitation patients. The comfortable and modern farmhouse aesthetic is reflective of Canal Winchester’s rural agricultural history and offers a diverse environment for residents. Multiple dining rooms, activity spaces, and lounges enhance the facility’s offerings, while the site will feature a pond with a walking trail and covered pavilion. Andrews Architects has worked closely with The MacIntosh Company from site selection through construction to develop a resident-centered environment that offers unique spaces throughout the facility, providing residents options for engagement and involvement in their care community.